Whether you have to deliver a speech or make a YouTube video, teleprompter comes handy to stick to a script. A teleprompter plays the script in front of you which you can read to the camera or use for references. There are many free online teleprompters that can do the job. Almost all of those online teleprompters use auto-scroll with an option to set the scroll speed. The problem arises when you have to stop due to some reason but the teleprompter keeps running. In such a situation, you either have to manually pause the teleprompter, or rewind it back to where you left. And, none of this is convenient. In this article, I will cover a free online voice controlled teleprompter. This teleprompter used your PC’s microphone and scrolls as you speak. It works best with the Google Chrome web browser. It might work with other browsers like Mozilla Firefox but the developer recommends to use it with Google Chrome for optimum response. 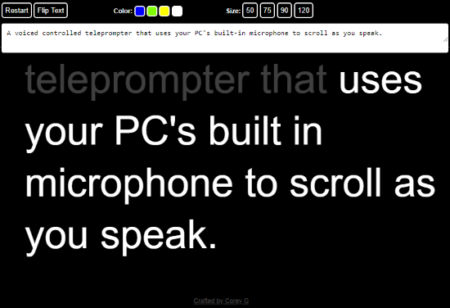 Teleprompt.me is a free online voice controlled teleprompter. It uses your PC’s built-in microphone to listen what you speak and scrolls accordingly. When you open this teleprompter website, it asks for microphone permission. Give it the permission and make sure that the microphone is working correctly. The user interface of this teleprompter is clean and easy-to-use. The main area is for the teleprompter with other functions on the top. On the top left side, it has a text box for the script. After pasting/typing the script to this text box, simply click anywhere on the screen to make the teleprompter ready. In terms of appearance, this teleprompter gives you options to change the text color and text size. It offers 4 color options and 4 text size options. The background is black. You can choose any text color and size which you find convenient. If you are using this teleprompter with a teleprompter screen or mirror where you have to flip the text, you can do that with the “Flip Text” button present at the top right side. Once everything is set, as you start speaking, this teleprompter highlights the words as you speak them; similar to a Karaoke. It automatically scrolls the script as you keep speaking and pause when you stop. After the pause, you can simply start speaking again from where you left and it picks you and starts scrolling as you speak. Moreover, you can also move the teleprompter position back and forth by tapping on the words. And, if you want to start again, you can do that with the “Restart” button from the top right section. 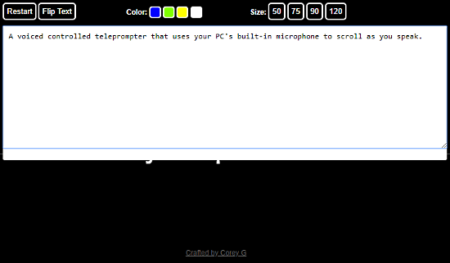 You can use this free voice-controlled teleprompter here. This free online voice-controlled teleprompter is a convenient tool that lets you skip the physically interact with the teleprompter to pause or play. You can simply control the teleprompter just by speaking the script; no additional command or interaction required. This way, you can focus on your work without worrying about the teleprompter.